The Faculty of Law has unveiled a permanent art installation in their lobby, paying tribute to Indigenous Peoples. Every time students, faculty, staff, and visitors enter the Faculty of Law building, they will be met with a reminder of the original inhabitants of the land on which Queen’s sits. This spring, the faculty launched a competition to commission a piece of Indigenous art to reside in the Gowling WLG Atrium. The goal of this installation was to portray the relationship between Indigenous Peoples in Canada and the law. “I know that the entire Queen’s Law community is thrilled with this beautiful addition to the school’s atrium, a moving recognition that Queen’s University is situated on the traditional territory of the Anishinaabe and Haudenosaunee peoples, as well as an important tribute to Indigenous legal systems,” said Dean Bill Flanagan. 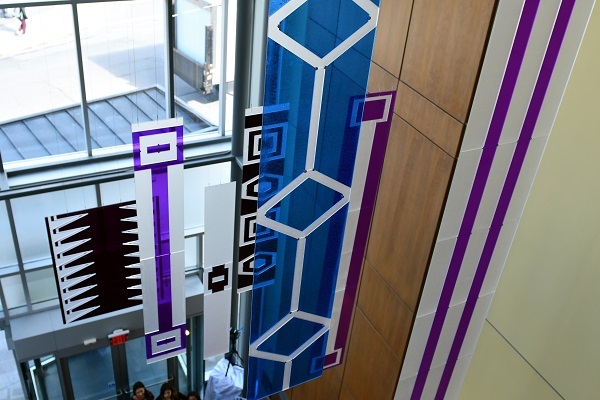 Artist Hannah Claus’ proposal, “Words that are lasting”, was announced as the winner in May, and she spent the summer preparing the art piece, which includes recreations of seven wampum belts suspended from the lobby ceiling. Ms. Claus is a visual artist of English and Kanien'kehÁ:ka / Mohawk ancestries and a member of the Tyendinaga Mohawks of the Bay of Quinte. She teaches contemporary Indigenous art as a sessional lecturer at Kiuna, a First Nations post-secondary institution, in Odanak, Québec. She is hopeful the art will both give Indigenous students, faculty, staff, and visitors something that relates to them when they enter the building, and encourage non-Indigenous people to learn more about the populations and cultures who live where they have chosen to study. The installation of this public art piece is an important element of the Faculty of Law’s multifaceted response to the Calls to Action of Canada’s Truth and Reconciliation Commission. The ceremony was video recorded and can be streamed.